The Iowa Stormwater Education Partnership is pleased to announce that Story County Conservation recently received the Stormwater and Urban Watershed Development of the Year Award at the 2019 Iowa Water Conference held in Ames. Mike Cox, Director Story County Conservation, Ted Tedesco and Jim Pease, Story County Conservation Board, Ryan Wiemold, Parks Superintendent Story County Conservation and Luke Monat, Shive-Hattery accepted the award at the conference. 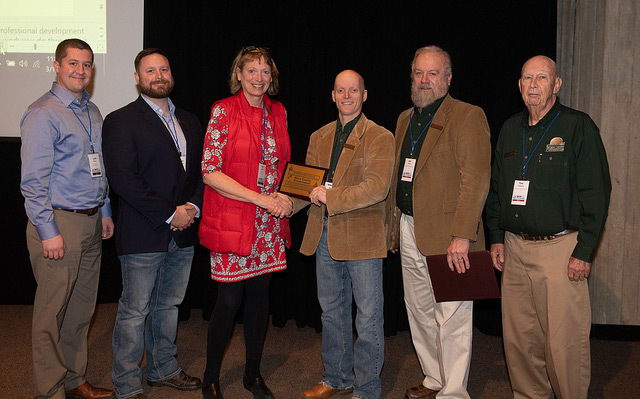 Story County Conservation was recognized for their partnership with the Iowa State University Research Park and Story County Board of Supervisors in creating The Tedesco Environmental Learning Corridor that focuses on progressive land management approaches in the urban-rural interface. It showcases conservation techniques, environmental education, water quality awareness, and trail connectivity. The Iowa Stormwater Education Partnership is a non-profit organization that supports urban stormwater and watershed management through the creation of educational resources and training programs.